It’s been said that well-fitting dance shoes should reflect a seamless extension from a dancer’s legs. Designed to be feather-weight whilst fully supporting your weight, proper fitting dance shoes are a tool in aiding you to keep balanced while you dance. Hence the choice of heels and designs for male and female dancers. There is little point in investing on dance shoes unless you are also prepared to invest time in assessing what works for your particular feet. Catering for width, insteps, bunions and toe shapes means that one style may not necessarily work for everyone. That makes online shopping for dance shoes in untested brands a challenge. No wonder that seasoned competitors and professionals tend to stick to reputable brands and styles that have worked best for them over time. That said, it’s also important to be aware that feet may change with age, calling for a different fitting, brand or style. 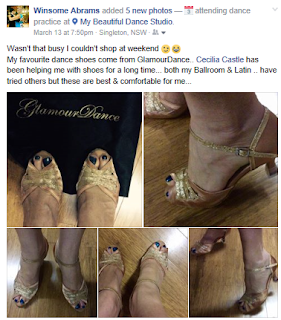 A seasoned competitor at a recent event decided to try on a wider fitting GlamourDance shoe with a lower heel, and reacted by saying “I’ve waited 30 years for a shoe that truly fits with absolute comfort, and this is it!” Our elated customer wore her new shoes straight into her next event, and reiterated her endorsement upon coming off the dance floor. The moral of the story is to keep your options open as time passes, and ensure your feet receive the best care you can give them so your dancing can always excel in absolute comfort. To your happy feet!